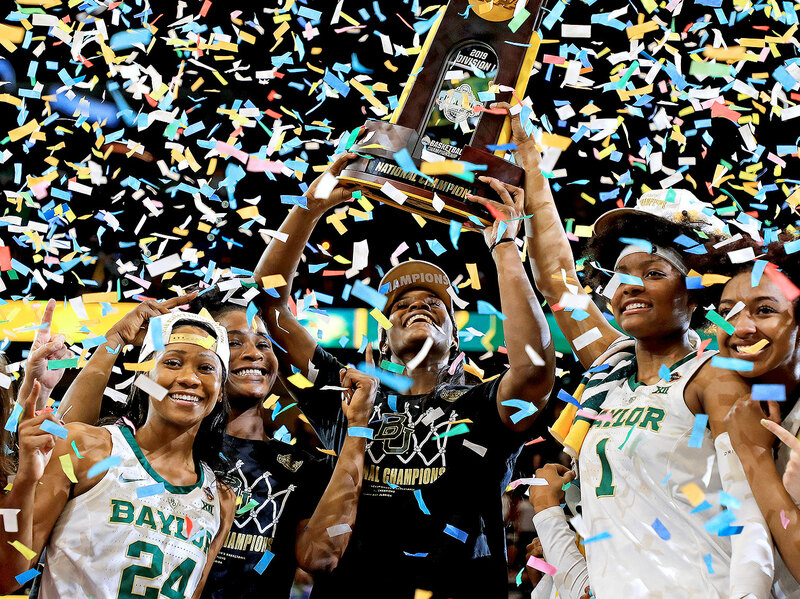 In a season of parity across women’s basketball, Baylor was the one consistent force, but the Lady Bears' journey to a title was far from simple. The guard who hit the game winner on Sunday night to earn Baylor a national championship nearly died at lunch earlier that day choking on a jumbo shrimp. On the second floor of the team hotel just a few hours before tip, Chloe Jackson decided to eat the crustacean without cutting it and quickly began desperately coughing. She was saved by freshman Honesty Scott-Grayson, who smacked Jackson on the back as hard as she could. The shrimp came flying out, landing harmlessly on the floor. It would be hard to disagree. Jackson started the game by calmly swishing her first five field goal attempts; by the end she had scored a team-high 26 points, knocking down crucial shot after crucial shot, none more important than her last of the night, an underhand scoop layup that she snuck past two Notre Dame defenders with 3.9 seconds remaining. The basket would give Baylor an 82–80 lead and, ultimately, an 82–81 victory for the program’s first title since 2012. It was the same play that coach Kim Mulkey had drawn up two nights earlier against Oregon, with just over 40 seconds remaining in the semifinal and the score tied at 67. The design was to get the ball into Jackson’s hands at the top of the key, send a screener to the right elbow, and let the team’s unlikely point guard do the rest. Both times Jackson blew past her defender and finished with her right hand. Both shots resulted in a win. The Lady Bears were in control from the opening tip against defending champion Notre Dame, leading by as many as 17 points in the second quarter and double digits through most of the game. The team’s senior center Kalani Brown—who throughout the season had teammates tell her that they were going to win it all so she could graduate a champion—relentlessly attacked the Irish inside, putting in 20 points and pulling down 13 boards. Junior forward Lauren Cox—who throughout the weekend Mulkey repeatedly called the teams leader—did a little bit of everything, like she always does, with eight points, eight boards and three blocks. Together the two form the country’s most formidable post duo, imprinting Baylor with the old school identity they pride themselves on. That identity had also been inextricably tied to the team’s stifling defense, which again was on full display. The Irish were cold early, shooting 27.5% from the field in the first half, as Baylor’s on ball pressure stymied any attempt to establish an offensive rhythm. That was nothing new. This year the Lady Bears had led Division I in opponent shooting percentage, shepherded by sophomore guard DiDi Richards, whom Mulkey credits for keeping the team’s mood light and who reminds Cox of a fly because of how irritating she can be to the player she is guarding. Despite battling foul trouble, Richards was her ebullient and annoying self, frustrating Notre Dame guard Arike Ogunbowale in the first two quarters, as last year’s Final Four hero entered the half shooting 5-of-16 from the field. Everything changed with 1:22 remaining in the third. Baylor was leading by 12 when Cox went up to defend a shot attempt and landed awkwardly on her left leg, immediately screaming “No!” The crowd went silent as Cox writhed on the court while her mother, Brenda, cried in the crowd and thought to herself, Please get up, please get up. Cox’s absence provided Notre Dame the window it needed to come storming back into the game. But as the Irish mounted their ferocious comeback—led by Ogunbowale, who scored a game-high 31 (17 of which came in the second half), point guard Marina Mabrey (21 points, including 4-of-8 from behind the arc) and forward Jessica Shepard (11 points, all coming in the second half)—it was Jackson who repeatedly had an answer. After Shepard hit a free throw to tie the game at 78 with 48 seconds to play, there was Jackson at the top of the key, taking one dribble and swishing a mid-range jumper. And after Shepard again hit two free throws to knot the game at 80, the ball was right back in Jackson’s hands with 17 seconds left. 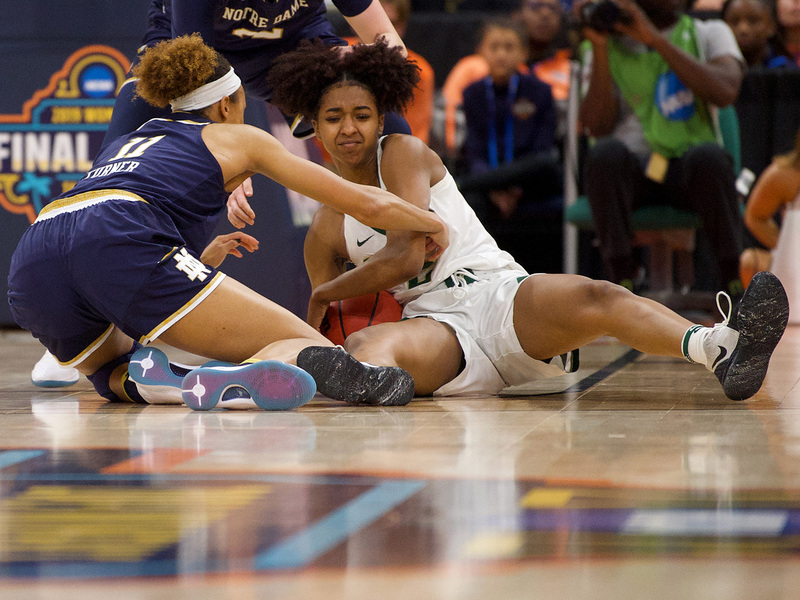 The guard patiently dribbled near mid-court as the clock waned; when it showed eight seconds, she exploded right, blowing past Notre Dame guard Jackie Young before deftly maneuvering under and around center Brianna Turner, the Irish’s career leader in blocked shots, and flipping the ball in. Ogunbowale would be fouled on the following possession but uncharacteristically missed the first attempt, sealing the Baylor win. As the celebration engulfed the court and tears began streaming down faces, Mulkey found Jackson and pulled her close. “You didn’t choke this time,” the coach said. Chloe Jackson sat in the office of her future coach last spring, both sides unsure what to make of the other. Jackson had already lived an itinerant college existence. The shooting guard originally enrolled at NC State in fall of 2014 but fractured her right foot four games into the year. Once the season ended, Jackson decided to transfer to LSU, where she was forced to sit out a year because of NCAA rules. She emerged in her second season in Baton Rouge, leading the team in scoring with 18.1 points per game. But the Lady Tigers finished the year with only 19 wins, losing in the first round of the NCAA tournament. Jackson had one season of eligibility left. She decided to upend her life again, this time in search of a championship. Baylor was not her first option. She was looking at Oregon, Louisville, Texas and West Virginia at first. Jackson knew that Mulkey had never before allowed a graduate transfer to join her team. But times were changing, Mulkey knew, and despite her trepidations she had to change with them. So in April, Jackson traveled to Waco. Mulkey took the guard on a tour of the school, dazzling her with Baylor’s beautiful campus and impressive facilities. Coach impressed player with honesty, admitting she was skeptical of inviting a graduate transfer into her program and telling her that if she wanted to play for Baylor she’d have to be willing to change her game. Jackson was a scorer, a natural two guard, but Mulkey wanted her to play point sometimes as well. The coach offered no promise of a starting position or even a guarantee of playing time. Jackson, too, was skeptical. But she wanted a challenge, wanted to play on the biggest stage for the ultimate prize. She had been through her share of struggles, and in those trying times her mother and grandmother would send her passages of scripture. After suffering the broken foot in 2014, she got her favorite one, Jeremiah 29:11, tattooed on her left shoulder. It reads, in part, “For I know the plans I have for you ... plans to give you hope and a future.” It was this belief that guided her decision. Something better awaited. For the final stop of the tour, Mulkey brought Jackson back to her office. Together the two sat and watched film, both of Jackson herself and also of past Baylor guards that Mulkey had coached. They studied tape of Odyssey Sims, a 2014 graduate, ’13 All-America and ’12 national champion. Mulkey assured Jackson that even though she’d have to slide to play point at times, she didn’t want to take away her scoring abilities. The coach did make one promise: The team would win. Still, when Jackson ultimately made the call to come to Waco, neither coach nor player were entirely certain it was the right decision. “It was a leap of faith,” Jackson says. Kalani Brown was all too familiar with Kim Mulkey’s no-nonsense style of coaching well before she committed to the school. The 6'7" center is the child of P.J. Brown, a 15-year NBA veteran, and Dee Brown, who had played for then-assistant coach Mulkey at Louisiana Tech in the 1980s. The Browns’ third daughter was different even before birth, her mother says. She caused serious complications during pregnancy, as Dee had to be placed on bed rest for seven months. Kalani would be born just minutes before her mother’s birthday and came out standing on top of her umbilical cord. At first Kalani had no interest in basketball, despite being the tallest toddler in every room. She played piano, she danced, competed in horseback riding and cheerleading. Like most kids growing up in Louisiana, Kalani also participated in parade marching—that is, until her eighth grade year, when Dee could no longer find majorette boots to fit her daughter’s feet. Can you try a sport for me? Dee pleaded. Basketball it was. Yet, her mother says, Kalani quickly proved to have two left feet. Dee worried she didn’t inherit any of the family’s hardwood talents. But young Kalani enjoyed being on a team, constantly laughing and smiling on the court. This made her parents more upset. Both were intense players and wanted their daughter to be the same. Why can’t I laugh? Kalani would ask. Dee decided to take her daughter’s development into her own hands, becoming both her AAU and high school coach. Mother would guard daughter in practice, never allowing Kalani to score. Instead, every time she went up for a shot, Dee would smack her or grab onto her arms. Kalani would scream for a foul. Dee would say, yes, yes, it was a foul. But you need to toughen up. She was searching for the fire that she knew lay dormant in her daughter’s soul. When Kalani arrived in Waco, she would call her mother and share her own tales of Mulkey’s particular motivational tactics. Like when the team walked into the locker room one morning after a loss and the coach was sitting on the floor, having spent the entire night at the facility without sleeping. Newspaper clippings about the game were scattered all over the floor, plastered on the walls and ceiling. Mulkey then put Kalani and the team through their own three-hour torture session that she called practice. “You have arrived,” Dee told her daughter. When the Lady Bears returned to campus last March 24, a day after their season ended in a shocking Sweet 16 loss to 13th-seeded Oregon State, Mulkey took her team off the bus and ordered them directly into the locker room. They were not allowed to eat or change or rest. On the four-hour plane ride home from Lexington, each of the team’s four coaches, plus both operations coordinators, jotted down a full page of notes about each player, scathingly critiquing their game. While the team sat, despondent, in a circle, the coaches read through each note for an hour and a half. After that was finished, the team watched the loss from start to finish, with Mulkey continually stopping the action to scream at her players. Shortly after that film session, Dee again took on the role of coach. She told Kalani that most people don’t get second chances in life to make things right. But you do. You get one more season to redeem yourself. Entering the year, Kalani was the lone senior on the roster and Dee was still trying to “shake the giant” inside. She told her daughter that she was the only one who wouldn’t have another opportunity. DiDi Richards was born Deauzya Richards, because her mother wanted her baby to be special, unique, the only one who would have a “U” and a “Z” and a “Y” in her name. But when Deauzya began playing basketball in the fourth grade, none of her teammates could pronounce her name. So “DiDi” it was. DiDi never cried as a baby, born with a smile on her face. Her mother, Unganetta, and father, Damian, say that she never fussed about anything and would lie awake in the morning, grinning, until her parents awoke. Theirs was a vibrant household, one filled with constant laughter and dancing. DiDi took after her mother in personality, always quick with a joke to lighten the mood at the most tension-filled times. She also, her parents say, always knew the best way to get under someone’s skin. When his 10-year old daughter said that she wanted to play football, Damian said no and told her that she’d be playing basketball. But instead of buying a ball and driving DiDi to a court, Damian took a handful of old shoes and drove to the elementary school parking lot. Then he placed the shoes all over the concrete and instructed his daughter to slide her feet and beat him to the spot as he sprinted from shoe to shoe. The drill got so intense that at one point he shattered a pair of glasses. They stayed out there for three hours, until darkness fell on the Texas town and mom demanded that dad let her baby back in the house. Soon Damian went to Walmart and replaced the shoes with orange cones. Every night, back to the parking lot they went, until DiDi was moving across the concrete as if she was gliding on ice. But after two rec league games, the parents realized they had a problem. While DiDi was sliding and stealing the ball from every fourth grader she would guard, she did not know what to do afterwards. Young DiDi constantly found herself under the basket all alone, because she was always the fastest on the court, and then proceeded to clank the ball off the side of the backboard. She would soon ask her parents to buy her a hoop, which they installed in the yard. In fifth grade, DiDi joined her first AAU team and her parents encountered another problem. Her father had gotten her to care so much about defense that every time an opponent scored on her she’d cry. Players would then laugh, and Damain did not like people laughing at his baby. So one day he took his daughter out to a double-rimmed hoop, watched her clank basket after basket, and proceeded to scream critiques after each miss until she broke out in tears. Then he calmly asked his daughter if his words had hurt, physically. “No sir,” DiDi responded. What you have to understand is that everybody in those stands, everybody on the court, they are trying to get under your skin, Damian told her. If you get under their skin first, then you are in control. DiDi struggled her freshman season at Baylor, playing sparingly. At the end of the year she had a conversation with her parents about possibly transferring. Ultimately, she decided that wanted to stay in Waco because she didn’t feel like she had been her true self on the court. Unganetta says that DiDi is “not a regular basketball player,” that she’s special, just like her name, and she needed to let the world see her personality. So before the season began, mother left daughter with one piece of advice. Lauren Cox wanted to go to the Olympics. She didn’t know what sport she wanted to compete in; she just knew she wanted to go. That’s what she told her mother when she was seven years old, right around the time that she spent two days in a hospital bed and was informed that she had Type 1 diabetes. Of course Cox’s parents were surprised as they sat there, listening to the doctor explain to their daughter how she would have to manage this disease for the rest of her life. What she’d have to do when her blood pressure got too high, and what she’d have to do when it got too low. How to count carbs and how to prick her finger throughout the day for insulin injections. The foods she’d have to eat, the ones she’d have avoid, and the options she’d have during the inevitable days when she’d come down with the flu and wouldn’t be able to eat anything at all. “It was all pretty overwhelming,” Lauren’s mother, Brenda, says. Her daughter had always been a natural athlete, tall but not clumsy, strong but not slow. She had run track, played soccer and tee-ball, volleyball and basketball. The oldest of four girls, Lauren was always extremely competitive, whether that would be racing her sisters up the stairs and to the car or competing in fierce games of Monopoly and Uno. But now, Brenda knew, her daughter’s life would never be the same. Still, as they walked out of the hospital, Brenda and her husband, Dennis, found some solace. They were taking their child home with them; many other families leaving the hospital were not. They sat Lauren down and told her that this disease was not going to stop her. She could still go to the Olympics, or whatever else she chose to do. At first Lauren did not want anybody to know about her diagnosis. She felt embarrassed and hid it from the world. But once she got to Baylor, Mulkey talked to her about the platform that she had. Embrace this, she said. Become a role model and show other kids that they can do anything. So Lauren made her story known, doing interviews and filming videos to champion the cause. Now, every year, Baylor has a “Type 1 Diabetes Awareness Game.” Brenda and Dennis routinely have strangers reach out over phone or email, saying that Lauren has been an inspiration. A family from New York called recently just to say that they had a child who was recently diagnosed, came across Lauren’s story and are all Baylor fans now. On the court, Lauren and Kalani formed a perfect partnership—one outgoing and friendly, the other shy and diffident. Kalani has brought Lauren out of her shell off the court, her mother says. On the court, she had emerged as the team’s emotional leader. That’s not really a surprise; Lauren had chosen basketball over volleyball in high school because she kept getting in trouble for yelling at her teammates, fed up with their lack of intensity. Lauren prided herself on her passing ability, how she was not just willing but able to find Kalani in the post with the perfect pass that led her to the perfect spot. Over their years together—first as reserves in practice, then on the court as starters—the two had learned to play seamlessly together, the Twin Towers of Waco. Before this season began, Lauren told her mother that she had one goal. Back on the court on Sunday night, atop a raised stage at center court, Kalani Brown lifts the walnut planked championship trophy high above her head as she beams with unfettered joy. This time her mother, separated by the dividing rope, does not tell her daughter not to laugh or smile. This time, Dee is smiling too. Minutes earlier Dee had fought through the crowd to find her daughter on the court. The two hugged as Dee told Kalani how proud she was of her. The center had asserted herself on the post throughout game, had found that elusive fire, continuously crashing the glass and pulling down six offensive rebounds. To Brown’s left, Didi Richards is dancing. 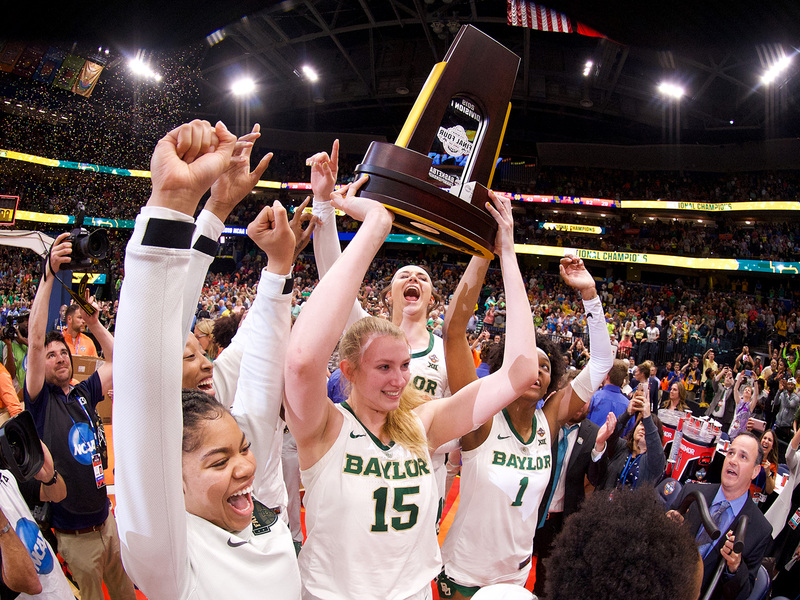 Earlier that week, as soon as the team had landed in Waco, she had sent a picture of an orange incised with the Final Four logo to her parents. That was a sign, they all knew. There is a photo the family keeps from when DiDi was a baby; in it, she is sitting on Unganetta’s father’s lap, wearing diapers and a polka-dotted bib, chewing on the very same fruit. This February her grandfather died in Florida, not too far from where the family now stood. “It was meant to be,” Unganetta says, wearing a T-shirt with a silhouette of her daughter’s face printed on it that reads: “All Cute & Stuff With My Afro Puffs”. Behind Brown, Lauren Cox leans on crutches. After she was wheeled to the locker room, her parents rushed to console her. Again, Brenda told her daughter that she was going to be O.K., that nothing will hold her down. With a few minutes left in the game and the score quickly narrowing, Lauren hobbled back to the bench to cheer on her teammates. Her presence, they all said, inspired them as the clock ticked down. “She’s a fighter,” Brenda says, choking back tears. Mulkey stands near the front of the stage, electric blue pantsuit gleaming. The coach has been through her share of struggles in recent years. In November of 2017 Mulkey’s daughter Makenzie Fuller, who also serves as a member of her mother’s staff, delivered a stillborn baby. Never one to let her true feelings not be known, Mulkey had spoken openly all week about the family’s tragedy and despair. 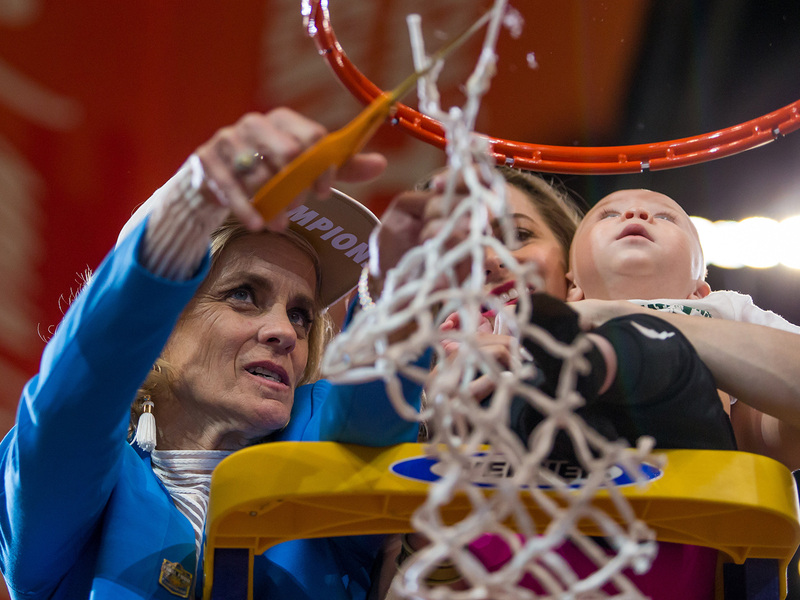 Now, two days after winning Coach of the Year honors and minutes after earning her third national title, Mulkey delicately cradles her five-month-old grandson, Kannon, in her arms. Later, when sitting on the postgame dais, Mulkey made sure to say that nobody in the room should call their championship a fluke. 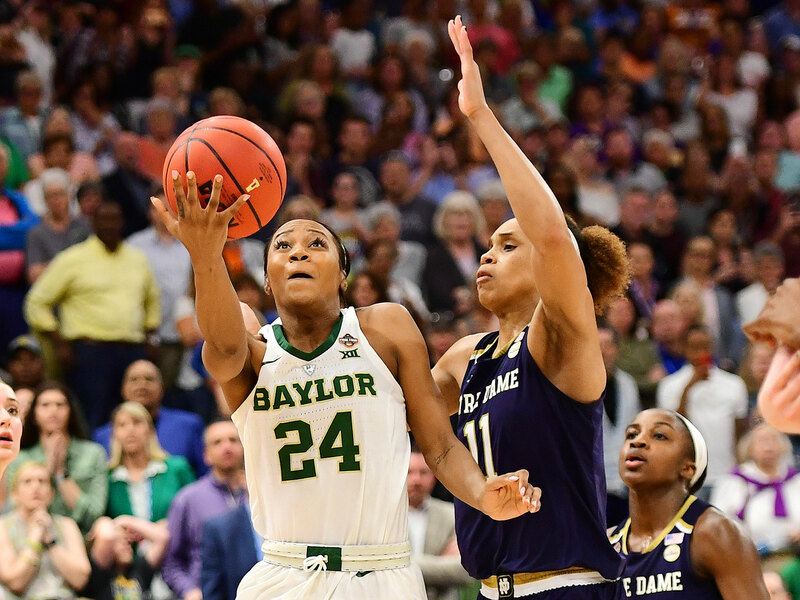 In a season of supposed parity for women’s basketball, Baylor was the one consistent force—losing only to Stanford, in December, then never again. The coach would praise her team while simultaneously taking shots at their critics, pointing out that her players had just beaten a Notre Dame team that played a zone defense after some said they couldn’t because of a lack of three-point shooting. The coach would go on to praise all of her players, none more so than the tournament MVP, Jackson, who stood beside her on the elevated stage in the celebration. It may have started off as a skeptical relationship, but when Mulkey dismissed starting point guard Alexis Morris from the program in September for a violation of team rules, it was Jackson on whom she hinged her entire season. Originally sold on the idea that she would only occasionally have to play the point, Jackson was moved full-time to the position. It was a process for Jackson, who had to gradually learn to be more vocal as a leader and more deferential as a passer. But on Sunday night, when the Lady Bears needed her the most, the old Chloe Jackson, the scorer, re-emerged. And as she poured in bucket after bucket, her parents sat in the stands and thought, That’s the Chloe we know.